James Bond had obviously moved home since the last time we saw inside his personal abode (Dr No). This was clearly a swanky bachelor pad with some iconic 1970s patterns mixed with some charming period furniture. Ever one to impress the ladies, our super spy hero has a kitchen full of mod cons, including a great coffee grinder and espresso blasting machine. 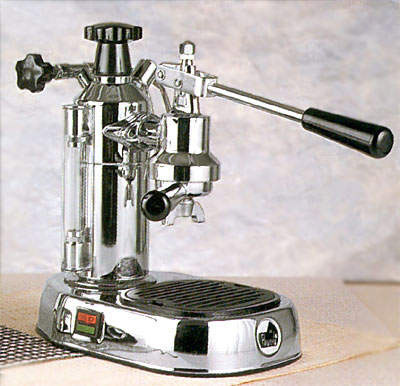 The machine is a La Pavoni Europiccola. Kit very much for restaurants - It is doubtful more than a handful of households worldwide would have seen such coffee sophistication. An updated version of the machine is still available at Amazon, and it really is very nice. You can order it for the tiny price of £500 by clicking on the text below.